About 1926, because that is when the Unites States celebrated its 150th birthday. Continental in this case refers to the Continental Congress, which governed the United States during the revolutionary war. However, I've collected a fair number of these eighteenth century costume patterns (and will eventually profile some of them here), and not all of them revolved around significant anniversaries. 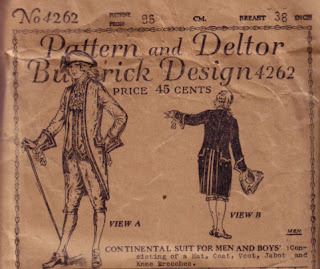 There is a wonderful photograph reproduced in What Clothes Reveal of "'costumed participants in Colonial Pageant...July 4 1921'" showing dozens of residents of Williamsburg Virginia dressed in pseudo eighteenth century clothing, with some of the men's suits looking very much like the illustration for this pattern. It would be interesting to study the numbers of July 4th parades over time. Even little towns can scare up George and Martha Washington on a float built around a hay wagon or a pick up truck. This pattern is unprinted. The instruction sheet, the Deltor, states that "If suit is to be worn once, seams need not be finished. If desired, it may be well made, so it may be worn on more occasions." Detailed instructions are given for sewing on braid and lace. I love these, especially the ones you have made up. 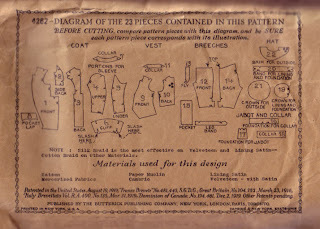 I have a few old patterns like there, but have never done anything with them. I am looking forward to seeing more. You might want to make tracings of your originals and work with the tracings, and I always recommend making up a muslin first. The draftsmanship of some of the older patterns is a bit slapdash, and it's handy to find this out in $2.00/yard muslin.